Microbial biofuel production provides a promising sustainable alternative to fossil fuels. 1-Butanol is recognized as an advanced biofuel and is gaining attention as an ideal green replacement for gasoline. In this proof-of-principle study, the oleaginous yeast Yarrowia lipolytica was first engineered with a heterologous CoA-dependent pathway and an endogenous pathway, respectively. The co-overexpression of two heterologous genes ETR1 and EutE resulted in the production of 1-butanol at a concentration of 65 μg/L. Through the overexpression of multiple 1-butanol pathway genes, the titer was increased to 92 μg/L. Cofactor engineering through endogenous overexpression of a glyceraldehyde-3-phosphate dehydrogenase and a malate dehydrogenase further led to titer improvements to 121 μg/L and 110 μg/L, respectively. In addition, the presence of an endogenous 1-butanol production pathway and a gene involved in the regulation of 1-butanol production was successfully identified in Y. lipolytica. The highest titer of 123.0 mg/L was obtained through this endogenous route by combining a pathway gene overexpression strategy. This study represents the first report on 1-butanol biosynthesis in Y. lipolytica. The results obtained in this work lay the foundation for future engineering of the pathways to optimize 1-butanol production in Y. lipolytica. 1-Butanol is an important advanced biofuel. Its energy content and characteristics are comparable with gasoline, which makes it an attractive alternative transportation fuel. This also makes 1-butanol a potential gasoline substitute, which is compatible with the existing infrastructure for fossil fuels . The industrial production of 1-butanol by the fermentation of clostridial species is already established. Recently, several studies have demonstrated heterologous production of 1-butanol by introducing the clostridial CoA-dependent 1-butanol biosynthesis pathway into various microbial host strains [2–5]. In the CoA-dependent route, two molecules of acetyl-CoA are converted into a four-carbon chain butyryl-CoA for subsequent reduction to 1-butanol. Since acetyl-CoA is the precursor molecule for 1-butanol biosynthesis, the yield of 1-butanol is highly dependent upon the availability of acetyl-CoA. 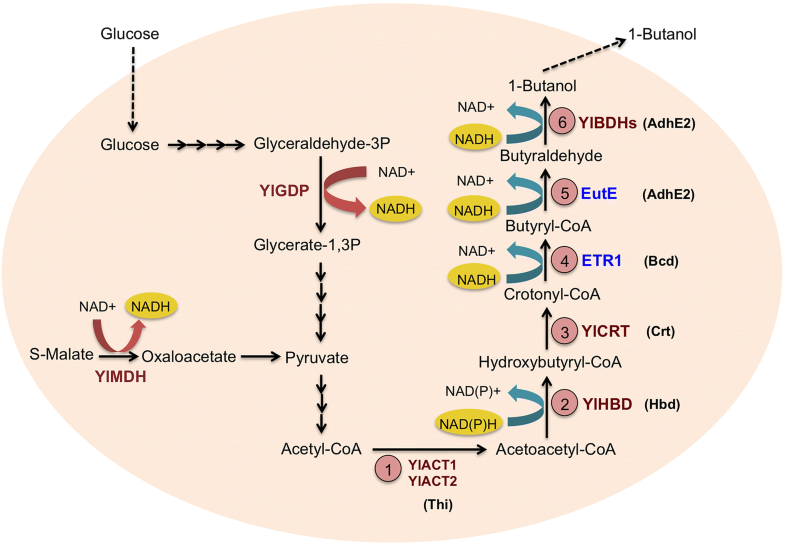 Therefore, it is beneficial to implement this pathway in production hosts with abundant intracellular acetyl-CoA, such as the oleaginous yeast Yarrowia lipolytica. Recently, an endogenous 1-butanol production pathway in yeast Saccharomyces cerevisiae was elucidated and the deletion of the alcohol dehydrogenase gene ADH1 was found to efficiently activate 1-butanol production in S. cerevisiae. Thus, ADH1 (or Adh1p) plays a central role in controlling the synthesis of 1-butanol through the endogenous pathway in S. cerevisiae . The endogenous pathway was also proven to be more promosing than the CoA-dependent pathway for high-level production of 1-butanol in S. cerevisiae. Therefore, we also attempt to identify the presence of the endogenous 1-butanol production pathway similar to S. cerevisiae and the potential regulation pattern of 1-butanol synthesis in Y. lipolytica. Yarrowia lipolytica naturally accumulates lipids at high amounts, i.e., up to 70% of cell dry weight and accumulates the lipids in its cytoplasm as triacylglycerols and stearoyl esters. These are subsequently metabolized to acetyl-CoA molecules via fatty acid oxidation in the peroxisome . Thus, an ample supply of lipid-derived intracellular acetyl-CoA is available for the production of 1-butanol and other acetyl-CoA-derived bioproducts via the CoA-dependent pathway. This yeast strain can also be exploited to utilize a variety of low-cost and abundant feedstock, such as lipids from food waste, as carbon sources for growth and substrates for bioconversion [8, 9]. In addition to these unique features, a growing number of available genetic tools, protein expression systems and a fully sequenced genome make Y. lipolytica become one of the most widely studied unconventional yeast platform for microbial production of a wide variety of chemicals, via metabolic engineering strategies [10–15]. Herein, a proof-of-principle study on the metabolic engineering of Y. lipolytica for the production of 1-butanol via the heterologous CoA-dependent pathway was reported and the presence of an endogenous 1-butanol production pathway was also confirmed in Y. lipolytica. The clostridial CoA-dependent 1-butanol biosynthesis pathway consists of six biochemical steps as illustrated in Fig. 1. To construct a pathway in Y. lipolytica for the conversion of acetyl-CoA to 1-butanol, a search of Y. lipolytica genome for a native CoA-dependent 1-butanol biosynthesis pathway homologous to that in Clostridia was first performed. Searching for alignment of the enzymes in the clostridial pathway was performed by using the Kyoto Encyclopedia of Genes and Genomes (KEGG) database and Basic Local Alignment Search Tool (BLAST). However, only a partial 1-butanol pathway containing four putative endogenous reactions homologous to steps 1, 2, 3 and 6 in the clostridial 1-butanol biosynthesis pathway was found in Y. lipolytica. The genes for the corresponding enzymes—YlACT1, YlACT2, YLHBD, YlCRT and several butanol dehydrogenase (i.e. YlBDH) candidates were also found in Y. lipolytica. YlACT1 and YlACT2 encode acetyl-CoA C-acyltransferases, which catalyze the initial step of the 1-butanol biosynthetic pathway for the conversion of two acetyl-CoA molecules to acetoacetyl-CoA. YlHBD encodes a 3-hydroxybutyryl-CoA dehydrogenase, which catalyzes the second step of the pathway, which converts reduced acetoacetyl-CoA to 3-hydroxybutyryl-CoA. The third step involves an enoyl-CoA hydratase encoded by YlCRT for the dehydration 3-hydroxybutyryl-CoA to crotonyl-CoA. For step 6, YlBDHs encode for butanol dehydrogenases that reduce butyraldehyde to the desired 1-butanol. Although the specific YlBDH has not been identified in this pathway, 1-butanol was detected when Y. lipolytica was fed with 0.1% butyraldehyde (data not shown). This indicates the presence of endogenous butanol dehydrogenase activity in Y. lipolytica, which can be attributed to the presence of numerous native alcohol dehydrogenases. In order to construct a complete 1-butanol biosynthesis pathway, enzymes capable of reducing crotonyl-CoA to butyryl-CoA (step 4 of the pathway) and its subsequent reduction to butyraldehyde (step 5 of the pathway) need to be introduced. This is because in the absence of heterologous enzymes to fulfill these roles, no 1-butanol was detected in the control strain Po1g::pYLEX1 (Additional file 1: Figure S1). To catalyze step 4, ETR1 (the trans-2-enoyl-CoA reductase gene) from S. cerevisiae was chosen. Although AdhE2 from Clostridium acetobutylicum encoding an aldehyde/alcohol dehydrogenase was commonly used for catalyzing step 5 of the pathway [2–5], this enzyme is oxygen-sensitive  and thus unsuitable for the pathway in Y. lipolytica, which is a strict aerobe. Therefore, the CoA-acylating aldehyde dehydrogenase gene, EutE, from Escherichia coli was selected, as EutE has been shown to be used successfully with ETR1 to produce 1-butanol in S. cerevisiae . ETR1 and EutE were integrated into the chromosome of Y. lipolytica and overexpressed under the strong hybrid promoter hp4d. In this study, the resulting engineered strain, Po1g::pYLEX1-EuET, produced 1-butanol at a concentration of 65 μg/L, hence demonstrating the functional expression of ETR1 and EutE. This also demonstrates the successful implementation of a CoA-dependent 1-butanol pathway, designed in this study, in Y. lipolytica. However, the titer obtained in the 1-butanol-producing Po1g::pYLEX1-EuET strain is low compared to other examples in the literatures on 1-butanol production in heterologous microbial hosts [2–5]. For example, by constructing the clostridial CoA-dependent pathway which contains the appropriate isozymes from a number of different organisms, 1-butanol was produced at a final titer of 2.5 mg/L in S. cerevisiae . Therefore, this heterologous CoA-dependent 1-butanol biosynthesis pathway needs further optimization to boost product titer in Y. lipolytica. To further enhance 1-butanol production following the successful construction of a functional 1-butanol biosynthetic pathway in Y. lipolytica, six heterologous and endogenous genes of the 1-butanol biosynthesis pathway were overexpressed. An additional copy each of YlACT1, YlACT2, YlHBD and YlCRT was integrated into the chromosome of Y. lipolytica, and overexpressed under the strong hybrid promoter hp4d along with ETR1 and EutE. In doing so, a driving force for the synthesis of pathway intermediates will be created, and will thus direct the metabolic flux towards 1-butanol synthesis in Y. lipolytica. Consequently, the resulting Po1g::pYLEX1-All strain overexpressing the six abovementioned pathway genes achieved a titer of 92 μg/L 1-butanol, which is a 42% improvement compared to the Po1g::pYLEX1-EuET strain (Fig. 2). We subsequently attempted to boost 1-butanol production by enhancing the recycling of reduced nicotinamide adenine dinucleotide (NADH), which is the cofactor that acts as the reducing agent in the 1-butanol biosynthesis pathway. In the constructed pathway designed in this study, four molecules of NADH are consumed for the production of one molecule of 1-butanol, along with concomitant formation of four molecules of oxidized nicotinamide adenine dinucleotide (NAD+). In several previous studies, increased NADH availability has been suggested to be important in achieving high titer production of 1-butanol via the CoA-dependent route [4, 18, 19]. Therefore, it is hypothesized that by overexpressing oxidative enzymes that utilize NAD+ as the cofactor, regeneration of NADH can be accelerated, thus providing sufficient supply of NADH for the 1-butanol biosynthesis pathway, which will thus enhance 1-butanol production. To this end, YlGPD and YlMDH were chosen for overexpression. YlGPD encodes for a glyceraldehyde-3-phosphate dehydrogenase that oxidizes glyceraldehyde-3-phosphate to 1,3-bisphosphoglycerate. YlMDH encodes for malate dehydrogenase that oxidizes (S)-malate to oxaloacetate. Both enzymes generate an NADH molecule from an NAD+ molecule per reaction, thus they can effectively recycle the NADH required for 1-butanol biosynthesis. Upon overexpression of YlGPD or YlMDH, in addition to the overexpression of six genes in Po1g::pYLEX1-All, 1-butanol titers of 121 μg/L and 110 μg/L were achieved after 24 h of cultivation which are 86% and 69% improvements compared to the Po1g::pYLEX1-EuET strain, respectively (Fig. 2). The enhanced titers demonstrated the efficacy of NADH regeneration by overexpression of YlGPD or YlMDH to boost 1-butanol production. Notably, longer cultivation time did not increase the 1-butanol titer. However, there is still much room for improvement in the implementation of the heterologous CoA-dependent 1-butanol biosynthesis pathway in Y. lipolytica. A deeper understanding of the flux throughout this 1-butanol biosynthesis route is necessary to identify and eliminate the bottlenecks and competing pathways, in order to further improve 1-butanol accumulation in this oleaginous yeast system. For example, the enzymatic steps that limit the metabolic flux from acetyl-CoA to 1-butanol have to be determined in order to select the necessary genes for overexpression to direct the flux towards production of 1-butanol. Screening of alternative heterologous enzymes to substitute with ETR1 and EutE may be worth pursuing, which will enhance catalysis of steps 4 and 5 in the pathway. To test a variety of isozyme candidates for each reaction in this pathway could also be one of the potential targets for greatly enhancing 1-butanol biosynthesis in engineered Y. lipolytica. Competing pathways also need to be identified so that the relevant genes can be deleted to accumulate 1-butanol and the intermediates. Additionally, other tools for protein overexpression in Y. lipolytica, such as multicopy integration of expression cassettes, can be employed to elevate the activities of the enzymes in the 1-butanol production pathway. Researchers recently reported the discovery of an endogenous 1-butanol production pathway in yeast S. cerevisiae and the alcohol dehydrogenase gene ADH1 was proven to be able to regulate high-level production of 1-butanol in a manner that remains unclear in S. cerevisiae . By homology search using Blastp program, we found all the Y. lipolytica enzymes that are homologues to those in the endogenous 1-butanol production pathway in S. cerevisiae (Fig. 3). Therefore, we attempted to create the alcohol dehydrogenase knockout mutant of Y. lipolytica to determine if the same mechanism is present within both yeast strains. Using the BLAST search tool, eleven putative alcohol dehydrogenase genes were identified in Y. lipolytica genome. The putative alcohol dehydrogenase genes are YALI0E17787g, YALI0D25630g, YALI0A16379g, YALI0E15818g, YALI0D02167g, YALI0A15147g, YALI0E07766g, YALI0F09603g, YALI0B10175g, YALI0F08129g and YALI0E07810g. These genes encode alcohol dehydrogenases which catalyze the reversible conversion between alcohols and aldehydes. We hypothesize that the deletion of these genes might lead to an accumulation of 1-butanol as happened with the deletion of ADH1 in S. cerevisiae. As a result, we successfully deleted ten genes in parallel (except for YALI0A16379g) individually by using the disruption cassettes with long homologous sequences in the Y. lipolytica strain Po1g KU70Δ. Details of gene deletion experiments and results have already been described in our previous paper . After confirming that the targeted gene had been deleted, the knockout mutant strains were then tested for 1-butanol production by using GC/MS. GC/MS analysis results indicated that 1-butanol was produced only in the YALI0E17787g-deletion strain at a titer of 100.2 mg/L (24 h) and with a productivity of 4.2 mg/L/h (Table 1). Moreover, GC/MS analysis results also indicated that 1-butanol was not detected in other ADH knockout strains (Table 1). The 1-butanol production in the YALI0E17787g-deletion strain also confirmed the presence of an endogenous 1-butanol production pathway in Y. lipolytica. 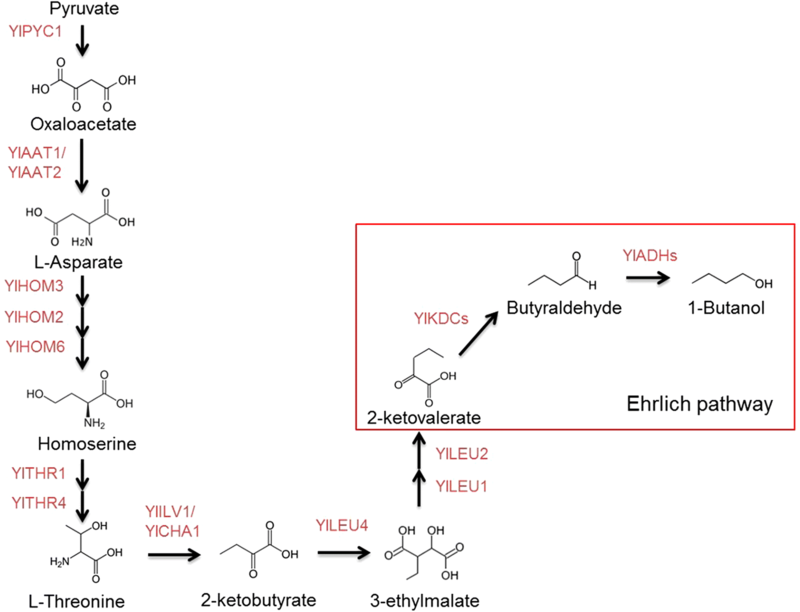 To our knowledge, this is the first proposed endogenous metabolic pathway for 1-butanol production in Y. lipolytica. Furthermore, the involvement of the gene YALI0E17787g in activation of the endogenous 1-butanol biosynthetic pathway in Y. lipolytica was confirmed for the first time. It indicates this gene appears to perform a specific function in the process of 1-butanol production by Y. lipolytica. One possible reason why the deletion of YALI0E17787g can activate 1-butanol production is that the alcohol dehydrogenase encoded by YALI0E17787g is primarily responsible for 1-butanol oxidation in Y. lipolytica. Another reason is that metabolic flux is redirected towards 1-butanol production or the flux through the 1-butanol synthesis pathway is increased when YALI0E17787g was deleted. However, the mechanism of how YALI0E17787g acts as a critical regulator for turning on the endogenous 1-butanol pathway and regulating 1-butanol production in Y. lipolytica is not yet well understood because the underlying mechanism was not directly examined in this study. Obviously, further experiments are also required to fully investigate the underlying molecular mechanism of how YALI0E17787g functions in regulating 1-butanol production in Y. lipolytica. Moreover, exploring the mechanism underlying this phenomenon has great potential not only for biotechnological applications but also for advancing our scientific understanding of this unconventional yeast. The titer achieved from this endogenous pathway is much higher than that for the heterologous CoA-dependent pathway. Interestingly, it was found that 1-butanol accumulated mainly intracellularly when the heterologous CoA-dependent pathway was used. A possible reason for such a situation is that the resulting 1-butanol was trapped intracellularly due to the relatively low level of 1-butanol production. In contrast, 1-butanol accumulated mainly extracellularly upon application of the endogenous pathway. A possible reason for this is active secretion of 1-butanol into the culture medium when it was accumulated at a certain concentration inside the cells. Furthermore, the growth profiles of all the engineered strains were similar to that of the parental strain, indicating that the genetic modification of Y. lipolytica in this study did not cause any adverse effect on cell growth. The employment of the endogenous pathway could also avoid issues related to introduction of a heterologous pathway. Thus, this endogenous pathway is far more promosing than the CoA-dependent pathway for high-level production of 1-butanol in Y. lipolytica. We have shown that the deletion of the gene YALI0E17787g encoding alcohol dehydrogenase led to much higher levels of 1-butanol than the titer obtained by the CoA-dependent 1-butanol pathway. This result demonstrated that the engineering of the proposed endogenous pathway for 1-butanol production in Y. lipolytica is highly promising. We thus focused on the YALI0E17787g-deleted strain for our subsequent metabolic engineering efforts towards boosting 1-butanol production. To further improve the production of 1-butanol in the YALI0E17787g-deleted strain, sixteen genes in the twelve steps of the proposed endogenous 1-butanol pathway (Fig. 3) were selected for overexpression. These genes encode different enzymes consisting of pyruvate carboxylase (PYC1, YALI0C24101g), aspartate aminotransferase (AAT1, YALI0B02178g and AAT1-2, YALI0F29337g), aspartate kinase (HOM3, YALI0D11704g), aspartate-semialdehyde dehydrogenase (HOM2, YALI0D13596g), homoserine dehydrogenase (HOM6, YALI0D01089g), homoserine kinase (THR1, YALI0F13453g), threonine synthase (THR4, YALI0F23221g), threonine dehydratase (ILV1, YALI0D02497g and CHA1, YALI0E10307g), 2-isopropylmalate synthase (LEU4, YALI0B07447g), 3-isopropylmalate dehydratase (LEU1, YALI0B01364g), 3-isopropylmalate dehydrogenase (LEU2, YALI0C00407g), alpha-keto-acid decarboxylases (ARO10, YALI0D06930g and PDC5, YALI0E07315g), pyruvate decarboxylase (PDC1, YALI0D10131g). All genes were overexpressed individually by integrating an additional copy of each gene into the chromosome of the YALI0E17787g-deleted strain. Individual overexpression of the selected genes did not lead to adverse effects on cell growth compared to the YALI0E17787g-deleted strain within 24 h of cultivation. The effects of overexpression of these 16 genes on overproduction of 1-butanol were investigated subsequently. The titers obtained in the gene-overexpression strains are shown in Fig. 4. It showed that the overexpression of five genes (AAT1, AAT1-2, HOM6, THR1, THR4) slightly improved the 1-butanol production compared to control. The HOM6 overexpressed strain achieved a titer of 123.0 mg/L, which was a further 22.8% increase in 1-butanol titer over the YALI0E17787g-deleted strain. However, the overexpression of other genes only led to a marginal improvement, or even a little decrease. To further increase titer, the HOM6 overexpressed YALI0E17787g-deleted strain with the highest titer 123.0 mg/L could be chosen for further engineering work. This proof-of-principle study describes the first biosynthesis of 1-butanol in the yeast Y. lipolytica via two independent routes: (1) the overexpression of two heterologous genes to complement a partially native 1-butanol CoA-dependent biosynthesis pathway and (2) engineering of an endogenous 1-butanol pathway. Furthermore, Y. lipolytica is an attractive host for the bioconversion of lipid-rich feedstock to value-added chemicals, owing to the yeast’s ability to utilize many hydrophobic substrates as carbon sources [8, 9]. Thus, the metabolically engineered Y. lipolytica strains described here provide a promising platform for the development of environmentally friendly 1-butanol production. Escherichia coli TOP10 and DH10B were used as the hosts for the cloning and propagation of plasmids. DH10B was especially used for cases with large plasmid constructs . Both E. coli strains were routinely cultured in Luria–Bertani broth (LB) or on LB agar plates supplemented with 100 μg/mL of ampicillin at 37 °C. Y. lipolytica strain Po1g, a leucine auxotrophic derivative of the wild-type strain W29 (ATCC 20460), was used as the base strain in this study. Y. lipolytica strain Po1g KU70Δ was used as a platform strain when constructing other chromosomal deletion mutants. Routine cultivation of Y. lipolytica strains was carried out at 30 °C in yeast extract-peptone-dextrose (YPD) liquid media or on YPD agar plates. Synthetic complete media lacking leucine (YNBleu) were used for the selection of Leu+ transformants. Plasmid pYLEX1 (Yeastern Biotech, Taipei, Taiwan) containing the strong hybrid promoter (hp4d) was used for gene expression in Y. lipolytica Po1g. The plasmids constructed for the gene expression cassettes are graphically depicted in Fig. 5 and Additional file 1: Figures S2–S5. The primers used for gene cloning and plasmid construction are listed in Additional file 1: Table S1. In order to overexpress multiple genes in the Y. lipolytica Po1g strain, the original expression vector pYLEX1 was first modified by adding XmaI and XbaI sites into the ClaI site of pYLEX1, so as to generate a new multiple cloning site (MCS-2), yielding pYLEX1-2. Another pYLEX1 derivative, pYLEX1-3, was created by adding MluI, MfeI and AvrII sites (MCS-3) to the ClaI site of pYLEX1 (Additional file 1: Figure S2). The ETR1 gene from S. cerevisiae and EutE gene from E. coli were codon-optimized and synthesized by GenScript (Nanjing, China) for expression in Y. lipolytica. The native gene sets (i.e. YlACT1, YlACT2, YlHBD, YlCRT, YlGPD and YlMDH) were amplified from Y. lipolytica genomic DNA. The intron-containing genes, YlACT1 and YlCRT, were assembled by overlap-extension PCR. The intron-containing gene YlGPD was amplified with a long forward primer. To clone the respective open reading frames of all these genes into pYLEX1, pYLEX1-2 or pYLEX1-3, an extra adenine nucleotide was added upstream of the start codons in the forward primers. Appropriate restriction sites were inserted downstream of the stop codons in the reverse primers. ETR1 was ligated into the PmlI/BamHI sites of pYLEX1 to yield pYLEX1-ETR1. EutE was ligated into the PmlI/BamHI sites of pYLEX1-2 to yield pYLEX1-EutE. pYLEX1-EuET was constructed by PCR amplification of the ETR1 gene cassette from pYLEX1-ETR1, using primers containing AscI, NheI, AvrII, MfeI, MluI, PmlI and PacI sites, and then ligating into the SalI site of pYLEX1-EutE (Fig. 5). YlACT1 was ligated into the PmlI/BamHI sites of pYLEX1 to yield pYLEX1-ACT1. YlHBD was ligated into the PmlI/BamHI sites of pYLEX1 to yield pYLEX1-HBD. The gene cassette of YlHBD was amplified by PCR from pYLEX1-HBD, using primers containing MluI, MfeI, XmaI and XbaI sites, and then ligated into the ClaI site of pYLEX1-ACT1 to yield pYLEX1-A1HB (Additional file 1: Figure S3). YlACT2 was ligated into the PmlI/BamHI sites of pYLEX1-3 to yield pYLEX1-ACT2. YlCRT was ligated into the PmlI/KpnI sites of pYLEX1 to yield pYLEX1-CRT. The gene cassette of YlCRT was amplified by PCR from pYLEX1-CRT, using primers containing PacI and PmlI sites, and then ligated into the SalI site of pYLEX1-ACT2 to yield pYLEX1-A2CR (Additional file 1: Figure S4). Gene cassettes of YlACT2 and YlCRT were digested from pYLEX1-A2CR with PacI and MfeI, and then ligated into the PacI/MfeI sites of pYLEX1-EuET to yield pYLEX1-A2CREuET (Additional file 1: Figure S5). 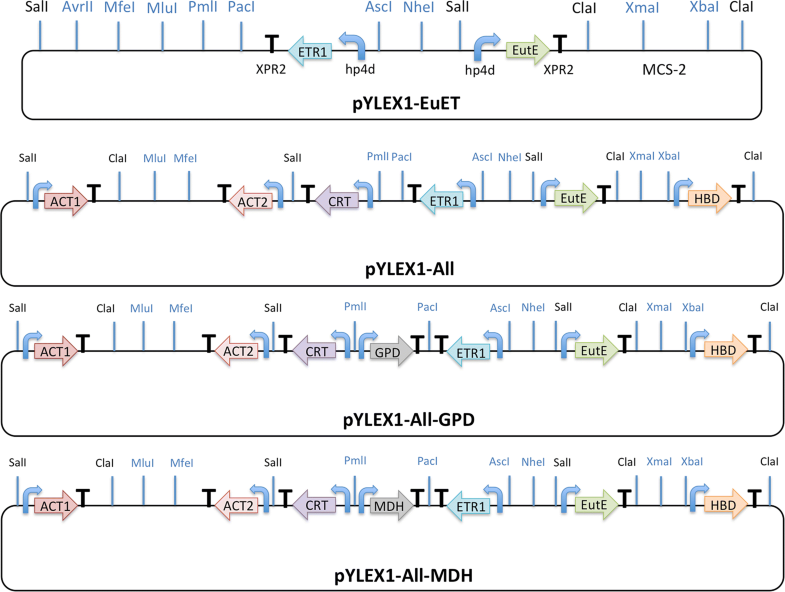 Following the construction of pYLEX1-A2CREuET, gene cassettes of YlACT2, YlCRT, ETR1 and EutE were digested from pYLEX1-A2CREuET using MfeI and XmaI, and then ligated into the MfeI/XmaI sites of pYLEX1-A1HB to yield pYLEX1-All (Fig. 5). The plasmid, pYLEX1-All, contains the gene cassettes of all six genes for building the clostridial 1-butanol pathway in Y. lipolytica. YlGPD was ligated into the PmlI/BamHI sites of pYLEX1 to yield pYLEX1-GPD. YlMDH was ligated into the PmlI/BamHI sites of pYLEX1 to yield pYLEX1-MDH. Gene cassettes of YlGPD and YlMDH were amplified by PCR from pYLEX1-GPD and pYLEX1-MDH, respectively, and then ligated into the PmlI/PacI sites of pYLEX1-All. The resultant plasmids were designated as pYLEX1-All-GPD and pYLEX1-All-MDH, respectively (Fig. 5). A detailed procedure for the gene deletion in Y. lipolytica was already described in our previous paper . In order to clone those endogenous genes into Y. lipolytica expression vector pYLEX1, another pYLEX1 derivative pYLEX1-NEW was created by adding XbaI, AvrII, MfeI and MluI sites into the BamHI site of pYLEX1 (Additional file 1: Figure S6). The subsequent construction process of pYLEX1-NEW recombinant vector series is the same as that of pYLEX1-EuET and pYLEX1-ETR1. Plasmids pYLEX1, pYLEX1-EuET, pYLEX1-A1A2CRHBEuET, pYLEX1-All-GPD, pYLEX1-All-MDH, were digested by SpeI, respectively. The linearized fragments were then integrated into the genome of the Po1g strain by transformation, using a protocol detailed in Additional file 1. The pYLEX1-NEW vector series were also first digested with Spe I and the resultant linearized fragments were integrated into the genome of the YALI0E17787g-deletion strain, in which the leucine selection marker was removed, by transformation using the same protocol as that employed to the Po1g strain. For the heterologous CoA-dependent pathway, the following engineered Y. lipolytica strains were generated: (a) Po1g::pYLEX1 (used as a negative control); (b) Po1g::pYLEX1-EuET; (c) Po1g::pYLEX1-All; (d) Po1g::pYLEX1-All-GPD; and (e) Po1g::pYLEX1-All-MDH. For the endogenous pathway, ten Y. lipolytica single-gene deletion mutants were generated . Sixteen genes in the twelve steps of the proposed endogenous 1-butanol pathway were selected for overexpression and thus sixteen gene-overexpression strains were generated accordingly. To measure 1-butanol production, seed cultures were prepared by inoculating 5 mL of YPD medium in culture tubes with the engineered Y. lipolytica strains. The cells were grown overnight at 30 °C with agitation. Following that, 250-mL flasks containing 50 mL of YPD medium were inoculated to OD600 0.05 with the seed cultures. All cultures were shaken at 225 rpm and 30 °C. Samples were then collected at 24 h, and 5 mL of each culture sample was centrifuged. Cell growth was monitored by OD600 measurement at every 2 h over 24 h. For the determination of extracellular 1-butanol, the product was extracted from the 2 mL supernatant by vortexing for 2 min with 2 mL of ethyl acetate. For the quantification of intracellular 1-butanol, the cell pellet from a 5-mL culture was lysed by eight rounds of 30-s bead beating with 1-min cooling on ice between each round. Following cell lysis, 1-butanol was extracted by vortexing for 2 min with 2 mL of ethyl acetate. The organic extracts were then analyzed by GC–MS using an HP 7890B GC with an Agilent 5977A MSD equipped with a DB-FFAP column (Agilent, Santa Clara, CA, USA). GC oven temperature was initially held at 45 °C for 2 min, and then ramped at 5 °C/min to 150 °C and held for 4 min. It was then subsequently ramped at 15 °C/min to 240 °C and held for 4 min. Helium was used as the carrier gas, with an inlet pressure of 13.8 psi. The injector was maintained at 250 °C and the ion source temperature was set to 230 °C. Final data analysis was achieved using Enhanced Data Analysis software (Agilent, Santa Clara, CA, USA). Isopropanol was used as an internal standard for the quantification of 1-butanol concentration. AQY, CYZ, DGX, MWC and SSJL conceived and designed the study. AQY, YKZ, YRP and ZHH performed plasmid and strain construction, and fermentation experiments. AQY, CYZ, DGX, MWC and SSJL wrote the manuscript. YKZ, YRP and ZHH revised the manuscript. All authors read and approved the final manuscript. This work was supported by the Open Fund of Ministry of Education Key Laboratory of Molecular Microbiology and Technology, Nankai University, Startup Fund for “Haihe Young Scholars” of Tianjin University of Science and Technology, the Thousand Young Talents Program of Tianjin, China, the Natural Science Foundation of Tianjin, China (17JCYBJC40800), the Research Foundation of Tianjin Municipal Education Commission, China (2017ZD03), the Innovative Research Team of Tianjin Municipal Education Commission, China (TD13-5013), the National Environment Agency of Singapore (ETRP 1201102), the Competitive Research Programme of the National Research Foundation of Singapore (NRF-CRP5-2009-03) and the Synthetic Biology Initiative of the National University of Singapore (DPRT/943/09/14). The Open Fund of Ministry of Education Key Laboratory of Molecular Microbiology and Technology, Nankai University, Startup Fund for “Haihe Young Scholars” of Tianjin University of Science and Technology, the Thousand Young Talents Program of Tianjin, China, the Natural Science Foundation of Tianjin, China (17JCYBJC40800), the Research Foundation of Tianjin Municipal Education Commission, China (2017ZD03), the Innovative Research Team of Tianjin Municipal Education Commission, China (TD13-5013), the National Environment Agency of Singapore (ETRP 1201102), the Competitive Research Programme of the National Research Foundation of Singapore (NRF-CRP5-2009-03) and the Synthetic Biology Initiative of the National University of Singapore (DPRT/943/09/14). 12934_2018_1014_MOESM1_ESM.docx Additional file 1: Table S1. Primers used for the construction of the heterologous CoA-dependent pathway. Figure S1. GC/MS detection of 1-butanol production in two Y. lipolytica engineered strains carrying the chromosomally integrated plasmid pYLEX1-All-GPD or pYLEX1-All-MDH. Figure S2. Map of the plasmids pYLEX1, pYLEX1-2 and pYLEX1-3. Figure S3. Map of the plasmid pYLEX1-A1HB. Figure S4. Map of the plasmid pYLEX1-A2CR. Figure S5. Map of the plasmid pYLEX1-A2CREuET. Figure S6. Restriction map of pYLEX1-NEW. Plasmid pYLEX1-NEW with an improved version of MCS was constructed by adding XbaI, AvrII, MfeI and MluI sites into the BamHI site of pYLEX1. Plasmid pYLEX1-NEW contains two BamHI sites. Details on DNA sequence alignment and additional Materials and Methods are also provided as additional information.